It's not the cheapest starter guitar, but if you're seeking inspiration for a younger player or yourself, this could be the most efficient way to get it. Fun and inspiring. Great with some crunch and a slide. 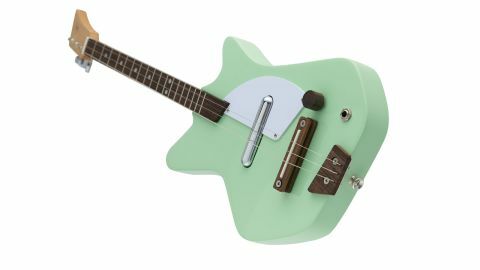 We've seen some small guitars, but the Electric Loog takes the biscuit: it's an electric incarnation of a Kickstarter-funded three-string guitar, aimed at aspiring learners and children, although it offers diddly bow-style thrills for seasoned players, too. With a 'My First Danelectro' vibe - enforced by a lipstick-style single coil straight from Dano itself - it certainly looks the part. The three strings are tuned to BGD - the idea is that by doing away with the extra strings, you learn faster; after all, three notes are all you need for a chord. "Adding a dose of crunch and a slide instantly conjures dirty Jack White blues"
When you open the box, you'll find the Loog in pieces. Not only does this keep costs down, but the designers reckon it helps to develop a bond with the instrument. It took us around 25 minutes to put together - attaching the tuners, and affixing the neck, bridge and strap pins to the body - and string up, using the straightforward instructions. Once assembled, the Loog had us exploring ukulele and mandolin-inspired playing; while adding a dose of crunch and a slide instantly conjures dirty Jack White blues. For existing guitarists, adapting chords to just three strings is a bit of a mind-bender, but the handy included chord charts are a big help. Aside from a few build-quality niggles on our review model (a loose-fitting neck pocket and slightly off intonation), the Electric Loog has us convinced.